While this diagram may not make this entirely clear, nodes and controllers communicate exclusively across the message bus (AMQP, currently). FlatDHCPManager will start up one dhcp server to give out addresses. It never injects network settings into the guest. Otherwise it behaves like FlatDHCPManager. Setup dhcp for this network. Returns a fixed ip to the pool. Do any initialization that needs to be run if this is a standalone service. Sets up matching network for compute hosts. Basic network where no vlans are used. FlatManager does not do any bridge or vlan creation. The user is responsible for setting up whatever bridge is specified in flat_network_bridge (br100 by default). This bridge needs to be created on all compute hosts. The idea is to create a single network for the host with a command like: nova-manage network create 192.168.0.0/24 1 256. Creating multiple networks for for one manager is currently not supported, but could be added by modifying allocate_fixed_ip and get_network to get the a network with new logic instead of network_get_by_bridge. Arbitrary lists of addresses in a single network can be accomplished with manual db editing. If flat_injected is True, the compute host will attempt to inject network config into the guest. It attempts to modify /etc/network/interfaces and currently only works on debian based systems. To support a wider range of OSes, some other method may need to be devised to let the guest know which ip it should be using so that it can configure itself. Perhaps an attached disk or serial device with configuration info. Metadata forwarding must be handled by the gateway, and since nova does not do any setup in this mode, it must be done manually. Requests to 169.254.169.254 port 80 will need to be forwarded to the api server. Implements common network manager functionality. This class must be subclassed to support specific topologies. Gets a fixed ip from the pool. Gets an floating ip from the pool. Associates an floating ip to a fixed ip. Create networks based on parameters. Returns an floating ip to the pool. Get the network host for the current context. Called by dhcp-bridge when ip is leased. Tasks to be run at a periodic interval. Called by dhcp-bridge when ip is released. Safely sets the host of the network. Sets up rules for fixed ip. VlanManager is the most complicated. It will create a host-managed vlan for each project. Each project gets its own subnet. The networks and associated subnets are created with nova-manage using a command like: nova-manage network create 10.0.0.0/8 3 16. This will create 3 networks of 16 addresses from the beginning of the 10.0.0.0 range. A dhcp server is run for each subnet, so each project will have its own. For this mode to be useful, each project will need a vpn to access the instances in its subnet. Get the network for the current context. 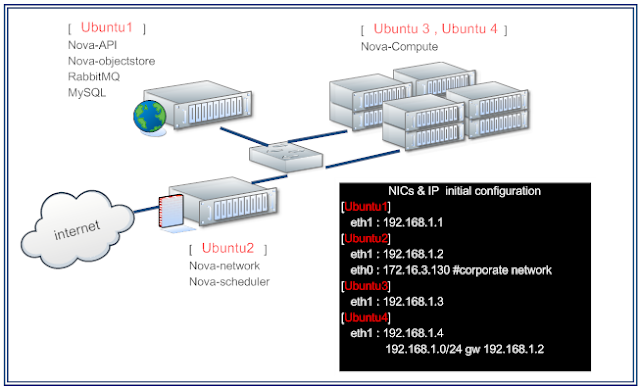 Implements vlans, bridges, and iptables rules using linux utilities. Create a bridge unless it already exists. interface – the interface to create the bridge on. net_attrs – dictionary with attributes used to create the bridge. If net_attrs is set, it will add the net_attrs[‘gateway’] to the bridge using net_attrs[‘broadcast’] and net_attrs[‘cidr’]. It will also add the ip_v6 address specified in net_attrs[‘cidr_v6’] if use_ipv6 is set. The code will attempt to move any ips that already exist on the interface onto the bridge and reset the default gateway if necessary.